1HourDirect.com Reviews - Legit or Scam? 1HourDirect.com Reviews – Legit or Scam? 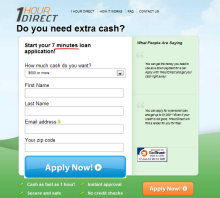 1HourDirect.com is a payday loan matching site that helps connect those looking for a short term personal loan with a lender that meets their needs. Payday loans are loans given to those who are looking for a short term loan, which is often approved simply based on whether or not you have steady employment and a bank account, rather than on your credit score. With just a 7 minute loan application process, 1 Hour Direct promises to approve your loan in as fast as 90 seconds. However, 1 Hour Direct payday loans is not actually a lender; rather it matches you with a lender. Lender matching sites like 1 Hour Direct are becoming more popular as more and more states enact specific laws that limit and regulate payday lending. 1 Hour Direct takes into account which state you live in before recommending a lender. Because of individual state laws, however, this site is unable to match lenders with residents from Arkansas, Arizona, Georgia, North Dakota, Oregon, and West Virginia. Always remember, however, when participating with payday lenders to make sure that you fully understand the terms of the loans and the fees that you will be charged with, as it is your responsibility to pay back the loan in full. Do you have experience with 1HourDirect.com? If so, please leave a review below.